As usual, I seem to be starting my winter boat projects far too late in the 'season'. The Blue Moon will be at her winter dock only until March, and I have a long list of projects, so I must get cracking. Luckily, I've already completed a few, including the one I'll document today. One of my big goals for this year was to do my own outboard servicing. My boating budget has been getting killed in recent years by the amount outboard motor mechanics charge to do routine maintenance. I've always told myself "You're not mechanical! ", but that excuse seems more and more lame these days, so after after paying last spring's ransom, I decided enough was enough. 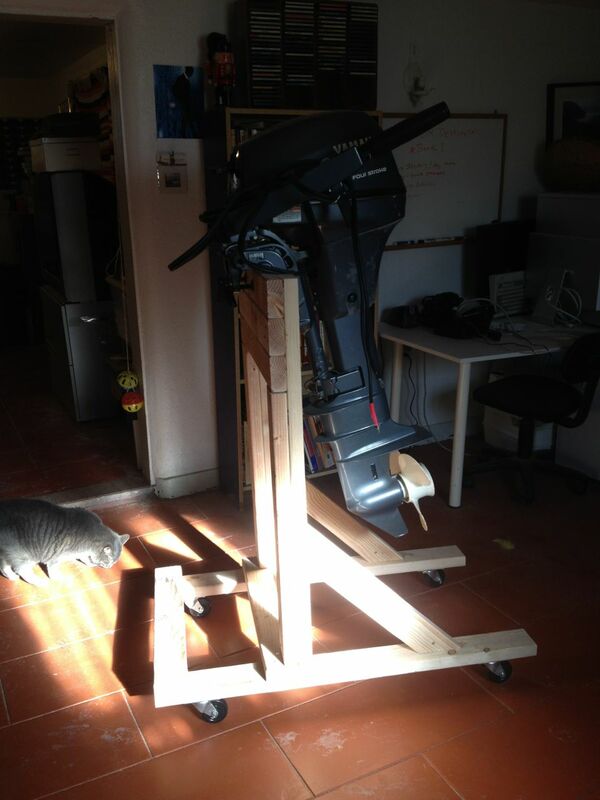 I bought the official Yamaha service manual for my long-shaft T9.9, and when my son Nick helped me haul the outboard off the back of the Blue Moon this fall, I had a sturdy outboard stand built and ready to receive it. The service manual was not cheap ($80), but it is written surprisingly well, with lots of small words and pictures -- ideal for mechanical duffers like me. Not only did it seem to make routine servicing sound easy to do, after reading through a few of the procedures, I actually looked forward to working on my faithful little donkey. 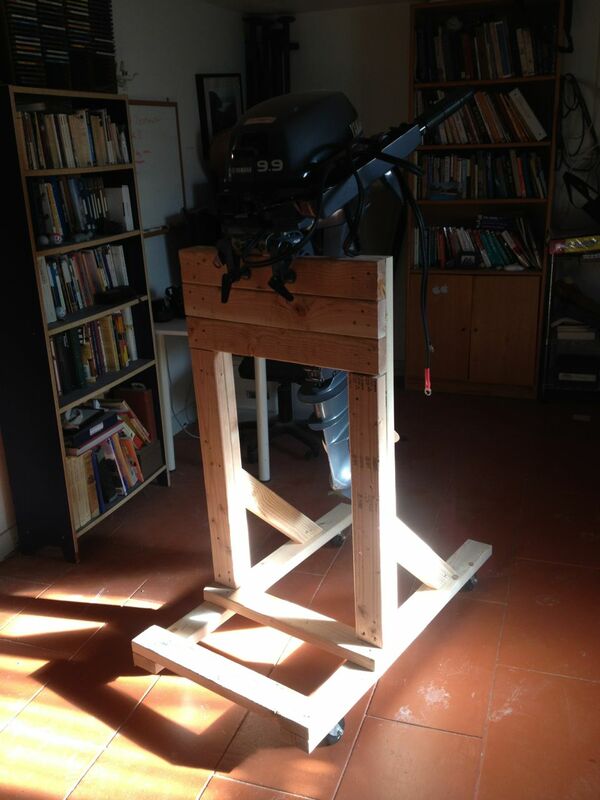 But to work on it, I needed a sturdy stand -- preferably one with wheels, that would allow me to move the outboard around by myself. The T9.9 is a hefty brute, weighing over 100 lb. and it is no fun to carry, believe me. After Googling around for some ideas, I found a video (see below) for a stand that met all my requirements. With a few 2x4's, glue, and screws, I soon had it banged together. The original builder, Chuck, didn't call for gluing everything together, but I decided that glue and screws would make the stand extra solid. Not sure if it really made any difference, but the finished stand feels extremely stiff and stable. Just what you want in a stand like this. I used fairly substantial casters, so it's easy to move the stand around -- even from the basement to the backyard. Exactly what I was hoping for. 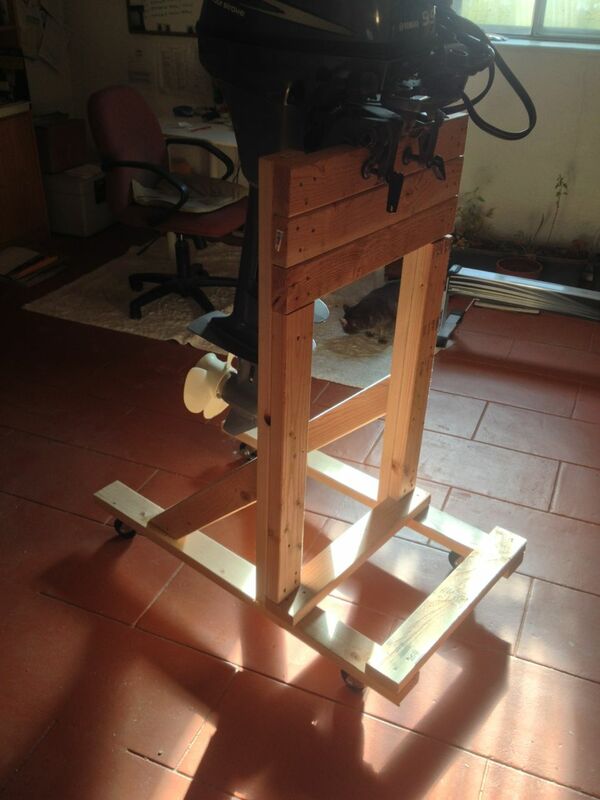 If you are interested in building a great stand like this, here is Chuck's original video. I was hoping for a nice paint finish, but still looks great! Well done!